Homepage. This page: Our visit to this 3 day motor racing event. Circuit Revival, Goodwood September 2006.
Review of the racing held at this Sussex circuit, Sept 1st - 3rd. Return to the main Goodwood section of oldclassiccar. The 2006 running of the Goodwood Revival took place on the 1st - 3rd September, with the weather decidedly mixed as the long weekend rolled by. Friday's practice (ie qualifying) day was mixed, which couldn't be said for the first day of racing proper, Saturday being decidedly blowy and damp all day. Sunday was equally overcast, at least til mid afternoon, when the clouds finally parted and sunshine wrapped up the 2006 event. We drove down on the Thursday, and camped just down the road from the track, meaning that we were able to arrive at the circuit good and early, avoiding any queues at the entrance. Traditionally we spend the first day mooching around the displays, and strolling around the full circuit to compare vantage points throughout the day. This was impeded slightly by some nanny interference, inflicted onto the event organisers by a pen pusher at the CAA, busying themselves with the finer points of Health and Safety legislation. The flight line has changed from the earlier events, and the areas of spectator viewing at either end - part way down the Lavant Straight, and between Madgwick and Fordwater, now have to be cleared in order that aerial displays can take place. With 3 or 4 air displays a day, I'm glad that I'm not a marshal having to shunt people from their vantage points throughout the day. Apparently this was introduced in 2005, but we didn't attend that event. Nice to know that the CAA cares so much, but to be honest I'd rather take my own chances and stand where I like. I feel safer having the Old Flying Machine Company pilots performing aerial ballet above my head, than walking through any town centre on a Friday night, and they've not banned that yet. But anyway, back to Goodwood's trackside activity. The first practice kicked off at 9am, for the Goodwood Trophy. This race caters for drivers in Grand Prix and Formula Libre type cars that would have originally seen action between 1930 and 1950. Delights seen in action included Alfa Romeo Tipo Bs, plus lone examples of 12C-37 and the wonderful 308C. ERAs were out in force as usual, several of which competed at the first meeting back in 1948 at Goodwood. 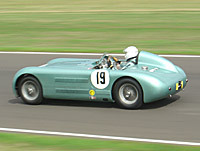 Maseratis were the most numerous of all the cars taking part, with examples from several years of the 1930s. Next up was practice for the Chichester Cup, with Formula Junior series cars from Elva, Lola, Stanguellini and many other manufacturers dicing on track for the pole position. After that came practice for the Fordwater Trophy (sports and endurance cars, 1960-66 type), with Austin Healey Sebring & Speedwell Sprites, MGs, Sunbeam Alpines, WSM Sprites and others all rubbing doorhandles. The Whitsun Trophy followed this, comprising a line-up of very tasty sports prototypes. Most memorable for me were the Ferrari 250 LMs & 330s, Lola-Chevrolets, and GT40. 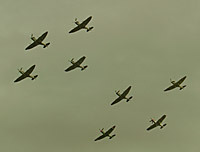 Following an air display (move along gentlemen, you can't stand there), it was time for the first practice session for competitors in the St Mary's Trophy. Two 12-lap races were to be held, one on Saturday, and the other on Sunday, so two practice sessions were required. This first session saw well known faces involved in motorsport take part, with A35s taking the battle to a pair of rapid Mk1 Jaguar saloons (2.4) at the top of the timesheets. Times were also set for the remaining races, namely the Glover Trophy (1.5 litre F1 and Tasman cars), Freddie March Memorial Trophy (cars that would have raced in the Nine Hours races), Brooklands Trophy (one of my favourites, with Brooklands-era cars taking part), Richmond Trophy (front engined F1 cars 1948-59), RAC TT Celebration (1960-64 GT Cars, eg Cobra, GTO etc), Sussex Trophy (1955-60 sports & sports-racing cars), the Madgwick Cup (1960-66 sports-racing cars under 3 litres), and not forgetting the 2 wheeled Barry Sheene Memorial Trophy. Throughout the weekend, practice sessions and races were interspersed with a number of trackside demonstrations. Each year a driver and their driving achievements are celebrated, and this year was the turn of the 1961 F1 World Champion Phil Hill, when he drove the 'sharknose' Ferrari 156. A fun display of microcars and bubble cars also took to the track over the weekend, with all manner of oddball 3 and 4 wheeled contraptions puttering around the undulating Sussex circuit. 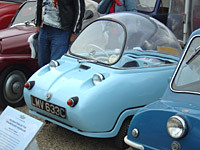 There were some real rareties on show, including delights such as the Brutsch Mopetta, Messerschmitt Cabinscooter (or 'Kabinenroller'), Frisky Sport, AC Petite, various Berkeleys, Peel P50 & Trident, Iota, Zundapp Janus, Goggomobil TS400, Subaru 360, Rytecraft Scoota-car, the sole BSA Ladybird, Allard Clipper, Rollera Francaise, Kleinschnittger F125, and Opperman Stirling. Photos of all these cars, plus those competing on track, will be added to the site soon! Despite Friday being just a practice session, most of the drivers were going at it hammer and tongs. Sadly one or two cars got out of shape, the drivers losing control, and resulting in very bent, and very out of shape, race cars. We were strolling along the section between Fordwater and St Mary's when a grey lightweight E-Type got majorly out of shape, lunching into the tyre wall before spinning back onto the track, wheels and lumps of delicate coachwork being scattered in all directions, sparks flying from the underside as it pirouetted to a halt in the middle of the track. Red flags were thrown, although they weren't instantly picked up by all drivers still vying for their best time. With marshals attending to the driver in the E-Type, a trio of charging cars tore down towards the stricken Jaguar, still going hell for leather. Whether they didn't see the red flags, or there was a delay in them being shown further up the road, I don't know. Fortunately they noticed just in time, and much frantic braking, locked wheels, and desperate steering work, saw the three dive either side the E-Type with marshals ducking for cover. It could have been very nasty, fortunately no-one was injured. The driver of the E-Type was taken away in an ambulance, suffering we believe from concussion. Another E-Type had already piled into the barriers earlier in practice for the TT Celebration, so Jaguar restorers were going to have a busy few months. 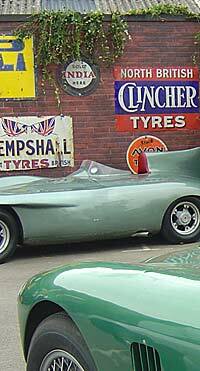 The latter car, a red lightweight, belongs to a well-known designer in Formula 1. The racing proper started on Saturday at 10am, following a number of displays, and blessing of the track. Single seaters from 1930-1950 took to the track, and some epic dices took place during the twelve lap Goodwood Trophy, the race being won by a Maserati 6CM, ahead of a 4CL and the lovely Alfa 308C. A full list of results can be found on the Goodwood website, so I'll not repeat them here in detail. Over the two days there were some fantastic races. Highlight for me was probably the double header St Mary's Trophy, where the aggregate times from both races were used to determine the final result. The first part took place on Saturday afternoon, on a wet, but slowly drying, surface (new for this year). A titanic battle at the front of the race saw the green A35 driven by T. Jardine (1293cc) scrapping with the grey Mk1 Jaguar 2.4 (BUY 1) peddled ably as always by Derek Bell. Incredibly in the wet the A35 had the legs on the Jag, mainly in the braking areas and through the twisty bits. 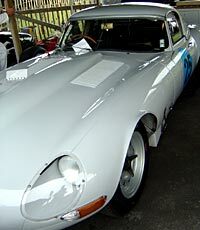 The Jag had more ooomphh on the straights, but the A35 was permanently affixed to the bumpers of the classic cat. As the race wore on, the track dried, passing some advantage over to the Jaguar, which won the race, just, from the baby Austin. The second part of the race, held on Sunday, was in dry-ish conditions, and benefited the larger engined car, resulting in an aggregate win for BUY 1, driven by Grant Williams in the second part. As already mentioned, the track had been re-surfaced and our impression was that grip was better, and definitely more consistent, resulting in fewer lurid slides by the drivers we thought. If this means less bent metal then it has to be a good thing I suppose! Other top Goodwood drives that spring to mind were Barrie Williams, sub'ing for S. Moss, in the four wheel drive Ferguson-Climax P99, and Michele Tommasi hurrying a Sprite in the Fordwater Trophy. The motorcycle races were both won by Wayne Gardner, on a Walmsley owned Matchless G50. Several modern-day drivers also took to the track over the weekend; I never thought I'd see a current F1 driver (Christian Klien) piloting an Austin A40 for instance (he drove a Cobra later on which made up for the lack of horses in the Austin!). Darren Manning was kept busy driving a Peugeot 203, and Dario Franchitti had been down to race a Wolseley 1500. Big names, both current and from the past, were liberally dotted throughout the weekend's races, the crowd getting chance to see drivers like Stirling Moss, David Piper, Stuart Graham, John Fitzpatrick, Jackie Oliver, Peter Brock (entertaining in a Holden FX), John Rhodes, Barry Lee, Rauno Aaltonen, Alan Jones, Hannu Mikkola, David Leslie, Sir John Whitmore, Anthony Reid, Bobby Rahal, Derek Bell, Tiff Needell, Michael Salmon, Barrie Williams (always worth watching), Richard Attwood, Derek Hill, Guy Broad, Jochen Mass, Alain De Cadenet, Patrick Tambay, Nicolas Minassian, Vitantonio Liuzzi, and plenty of others. Previous years have also seen Berger, M. Brundle, Surtees, D. Hill, and Brabham in evidence at the Revival, but not this year. The combination of great racing, aerial displays (this years remembering the late Ray Hanna, MH434 Spitfire pilot), and the many displays dotted around the spectator areas, once again resulted in an amazing weekend's entertainment. Mods on scooters, rockers on classic British bikes, old garage scenes, tuition on tuning SU carbs, policemen on ancient motorcycles, a 50s-style scrapyard, other exhibits and the extensive trade area, all made for a great time. 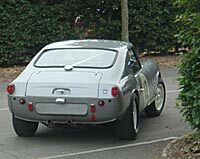 I must also mention the pre-66 carpark - well worth a good look around as there are some wonderful old motors parked there each day during the Revival meeting weekend. A great deal of effort must go into creating some of the old garage scenes at the Goodwood Revival, with all manner of garage tools, tins, petrol cars and enamel signs, rubbing shoulders with early petrol pumps, vintage motor parts, and other 'clutter'. The effect is amazing, and a credit to the organisers who must put a great deal of time and thought into these presentations. One display worth mentioning again is the scrapyard area, in which the children's design-a-car competition winner gets his creation built for real. The office is a tatty old caravan, surrounded by some very interesting old iron that has been purchased to use 'on set', including an A30 that had been on fire and left outside to rust by the looks of it, and a very restorable looking Mk1 Ford convertible. A replica of the first Supermarine Spitfire was present, in dismembered form, as was the fuselage of a Walrus seaplane from the same manufacturer, which will one day fly again hopefully. In 2015, we made our return to the Revival, exhibiting my old car transporter. Details of that visit may be found on this page.